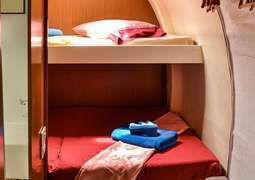 The cabins on board the Cuba Catamaran allow for relaxation when you aren't exploring the waters and shores of Cuba. With a chef on board, all meals on board the boat will be freshly prepared featuring local ingredients and will be served in the covered dining area. With a 'Galley' and 'Saloon' on board the boat, there are plenty of opportunities to relax and socialise in your downtime.